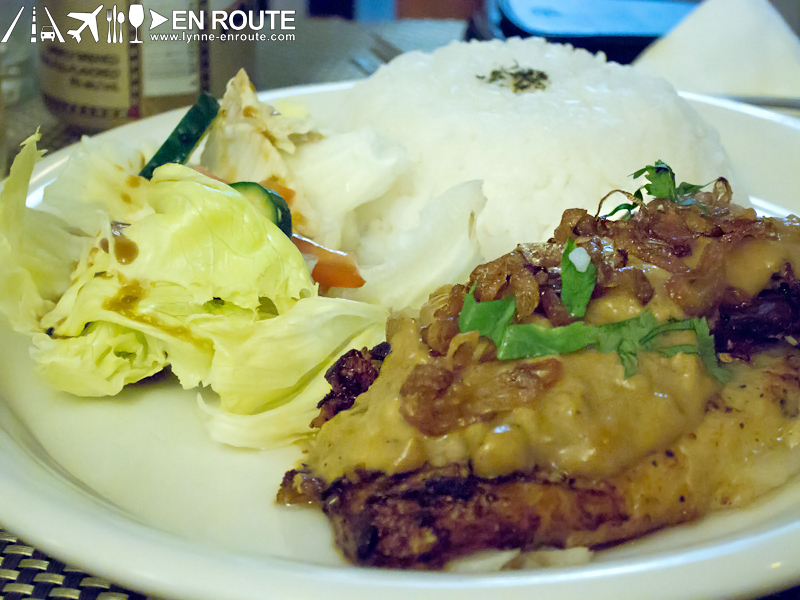 The Maginhawa area of Diliman, Quezon City is a food haven. 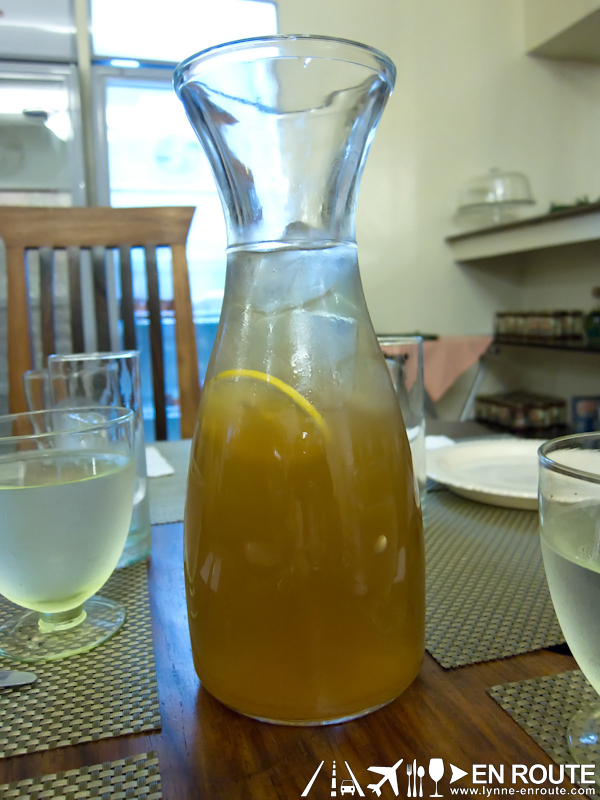 Up until recently, we’ve been missing out on this treasure trove of delights for the tummy. But no longer. We have realized the error of our ways and have embarked on more frequent trips to this part of the metro. It’s a common thing to say, “Compliments to the chef” when you’ve had an amazing meal. But what if you loved it so much that you felt the overwhelming desire to Kiss the Cook? 😛 Cooks are celebrities in their own right and the kitchen is their stage. And walking into the restaurant is your meal ticket. 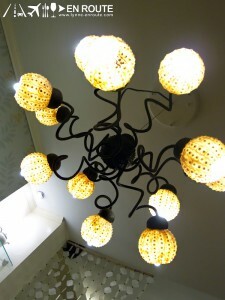 Warm lighting ushers you into the simply-furnished interiors. Look closer and you notice the little details like dainty tea cups, colorful pots, interesting paintings and some delicate patterns on the wall. Need some retail therapy? 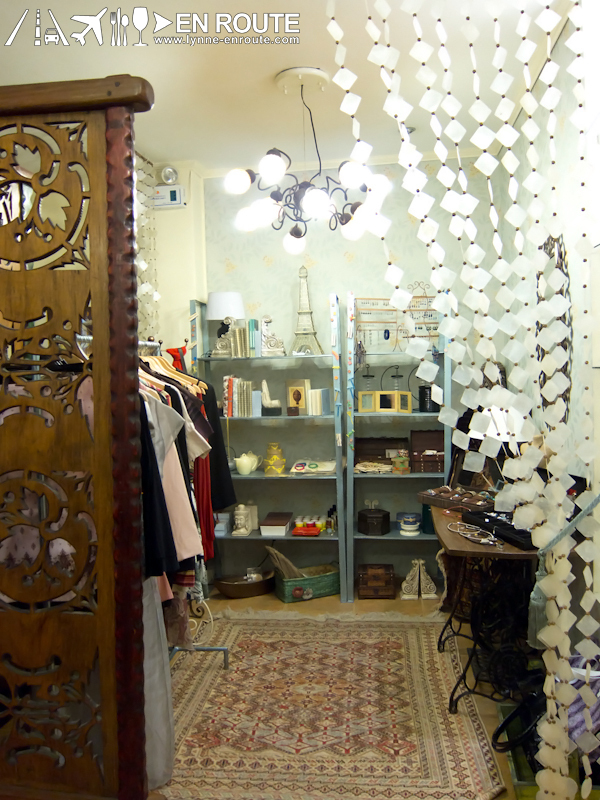 They have a corner which they call the Kitschy Little Boutique that showcases trinkets, clothes, and other decorations. 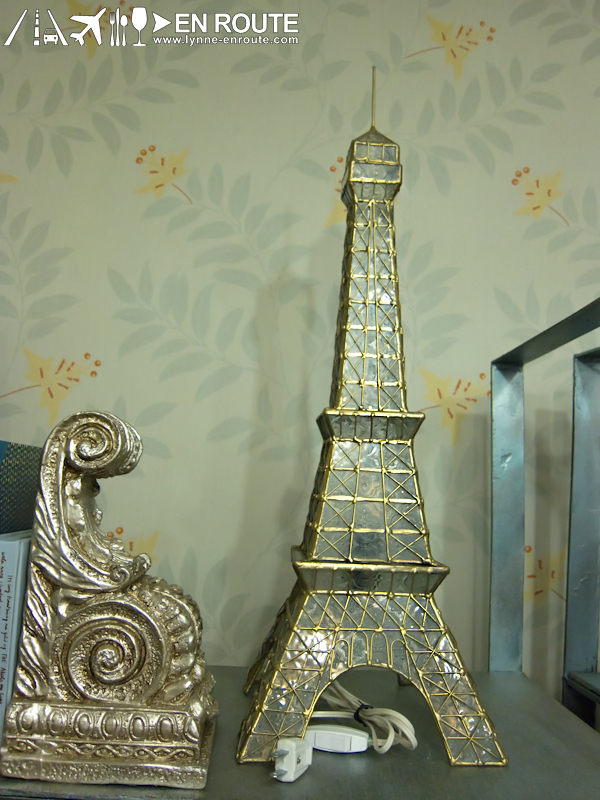 What personally caught my eye was this Eiffel Tower capiz lamp. I thought it was just lovely. Definitely a nook for interest while you’re inside. Like a side story in a plot. Kiss the Cook Gourmet’s menu is a collection of cooking inspiration across the globe. 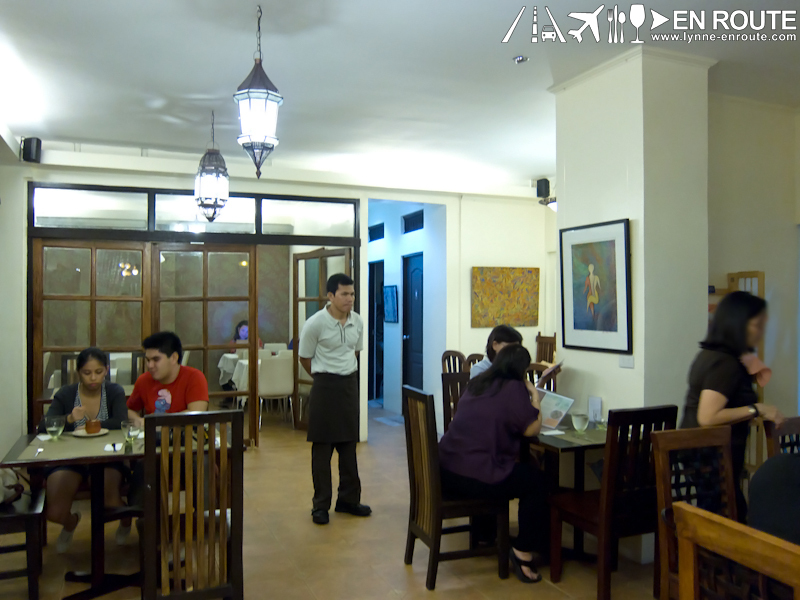 There are Mediterranean and Filipino touches to name a few. Start off the show with an appetizer of Assorted Chorizos in Garlic (Pamplona, bilbao and morcilla with garlic slivers, Php 225) served with toasted bread. 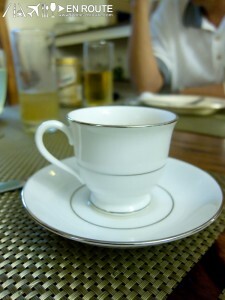 Savor the sweet and spicy flavors of the chorizo and wash it down with Lemongrass Tea (Php80) for a refreshing contrast. 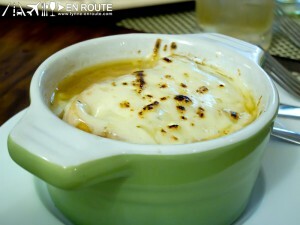 They have hearty soups like French Onion soup (Caramelized onions in a beef brandy broth, topped with bread and manchego cheese, Php 135) as well. Whether you’re looking for meat, fish or pasta, Kiss the Cook Gourmet has a selection for you. And their servings are pretty generous! If you have tiny appetites, you can even half an order with someone else. 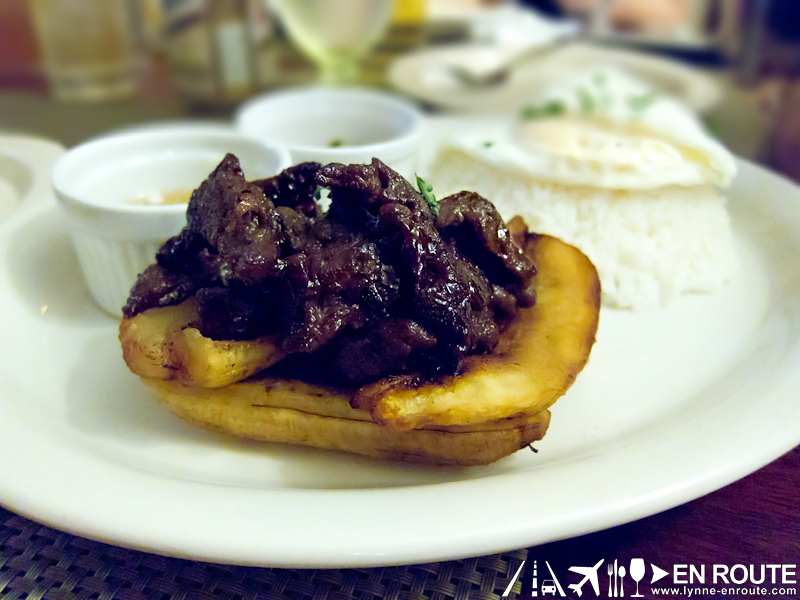 The main attractions for our stay included Sirloin Beef Tapa, a Filipino breakfast favorite. They served it with fried plaintains, vinegar, tomatoes, and rice topped with an egg. If you’re like us and you love all-day breakfasts, you’ll enjoy this dish. 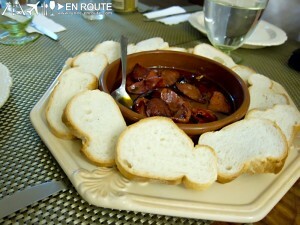 You hardly need vinegar or tomatoes for it because the tapa itself has a nice flavor already. And the banana adds a sweet twist to every bite. 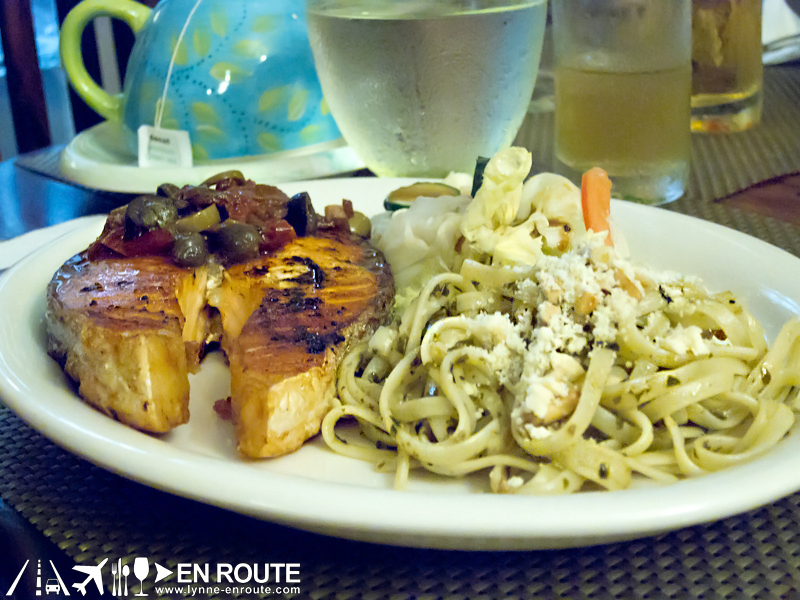 The Salmon Steak Veracruz (Sauteed with sundried tomatoes, olives and capers on pasta, Php 385) was actually quite overwhelming given the portions. You have a nice and light pasta and greens to complement the salmon. And lastly, there’s a mystery dish in this post! We just can’t seem to remember what this is but we do have memory of it being finished completely, save for the greens (as we are really more meat-eaters in general). They were out of Belgian Chocolate Decadence for dessert that night so we decided to skip it. After all, we were quite full already. Call them at +632 434 3700, check them out on Facebook (Kiss the Cook Gourmet), or send your e-mails to kissthecookgourmet@gmail.com. 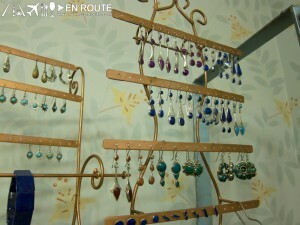 See more of our good finds on Facebook!